You don’t need to be an expert in ground-to-air warfare, radar, missile ordnance, or forensic criminology to understand the three fundamental requirements for prosecuting people for crimes. The first is proof of intention to do what happened. The second is proof of what could not have happened amounts to proof that it didn’t happen. The third is proof beyond reasonable doubt. These are not, repeat not, the principles of the Joint Investigation Team (JIT), a team of police, prosecutors, and spies from The Netherlands, Ukraine, Malaysia, Belgium, and Australia. They have committed themselves to proving that a chain of Russian military command intended to shoot down and was criminally responsible for the destruction of Malaysia Airlines Flight MH17 on July 17, 2014, and for the deaths of all 298 people on board. The JIT case for Russian culpability hinges on five elements occurring in sequence – that a BUK missile was launched to the east of the aircraft, and approached it head-on, before exploding on the port (left) side of the cockpit. Pause, rewind, then reread slowly in order to identify the elements of intention, causation, and culpability: (1) the BUK missile was aimed with a target acquisition radar by operators inside a BUK vehicle at a target flying in the sky and ordered to fire; (2) they fired from their vehicle parked on the ground facing east towards the aircraft’s approach; (3) the missile flew west and upwards to a height of 10,060 metres; (4) the warhead detonated; (5) the blast and the shrapnel tore the cockpit from the main fuselage; destroyed one of the aircraft engines; and caused the aircraft to catch fire, fall to the ground in pieces, and kill everyone. On Wednesday afternoon, in the small Dutch town of Nieuwegein, two Dutchmen, one a prosecutor, one a policeman, claimed they have proof that this is what happened. For details of the proof they provided the world’s press, read this. Later the same day, in Moscow, a presentation by two Russians from the Almaz-Antei missile group, one a missile ordnance expert, the other a radar expert, presented their proof of what could not have happened. Click to watch. Paulissen may be right. To prove he’s right all he has to do is to fill in the gap between the JIT version of what happened and the Russian version of what could not have happened by answering these questions. To convince a court and jury, Paulissen’s answers to these questions must be beyond reasonable doubt. 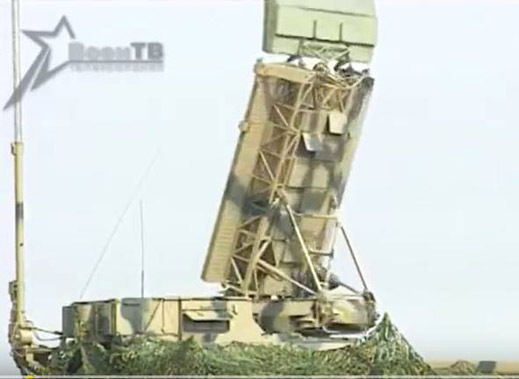 The newest models of the Buk system have incorporated the target acquisition radar on board, and the vehicle is called a transporter erector launcher and radar (TELAR). This radar can be seen in the grey box attached to the front of the turret. Unlike the old TAR, though, the antenna in the grey box has a relatively narrow 120-degree focus unless the entire turret is rotated. The JIT’s evidence and animations (below, left) indicate a TELAR. In the JIT claims of the convoy and route travelled by the BUK to and from the alleged firing point, there is no sign of a TAR vehicle. The BUK self-propelled missile launcher with onboard target acquisition radar (box in front) – left, JIT animation; right, a real Russian TELAR. Question 2. For the BUK missile the JIT claims to have been fired from a position to the east of the aircraft, the missile must have been visible to the pilots in the cockpit as it approached the cockpit window in clear sky. How then can the JIT explain the lack of a record from the cockpit’s voice recorder (CVR) that the pilots saw anything? Between the last pilot voice contact with Dniepropetrovsk Air Traffic Control, and the destruction of the aircraft, there were four seconds on the CVR tape. Repeat: IT TAKES FOUR REGULAR SECONDS TO READ THIS ALOUD. Did you see the nine words? Did you have time to say them aloud? The CVR tape from the MH17 cockpit has not been released publicly. However, the Dutch Safety Board (DSB) reports of last year say the last 4 seconds are soundless; not even the pilots’ breathing can be heard. The evidence can be followed here. How does the JIT explain the missile trajectory if it was not seen by the pilots? Also, the JIT revealed on September 28 for the first time that the Ukraine has released its air traffic control tapes and communications for JIT analysis. Do the Ukrainian audio and radar tapes provide evidence that someone on the ground spotted the approaching missile during the 4 seconds the pilots in the MH17 cockpit saw, heard, said nothing? If the Ukrainian tapes are as silent as the cockpit voice recorder, then there is proof – nothing could have approached MH17 head-on from a firing position to the east. Question 3. When a BUK warhead explodes, it releases about 7,800 metal fragments or shrapnel. For more details, read this. 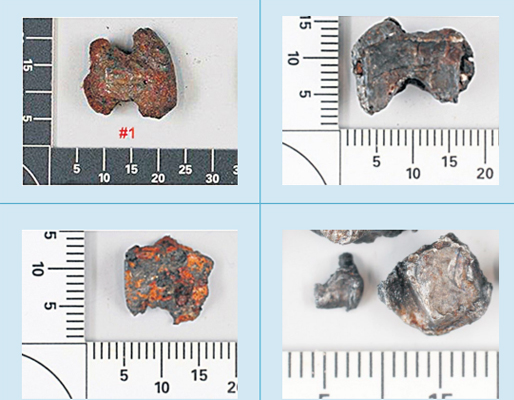 The spread or spray of the shrapnel after detonation is not more than 60 degrees. From mapping this spread from the impacts of metal fragments on aircraft panels it is possible to determine the angle of the missile to the aircraft at detonation. This in turn allows the tracking of the missile’s approach trajectory and the firing position on the ground. Testing warhead detonation against aircraft panels will also reveal the number and type of shrapnel impacts which ought to be registered if the missile and warhead types have been correctly identified. 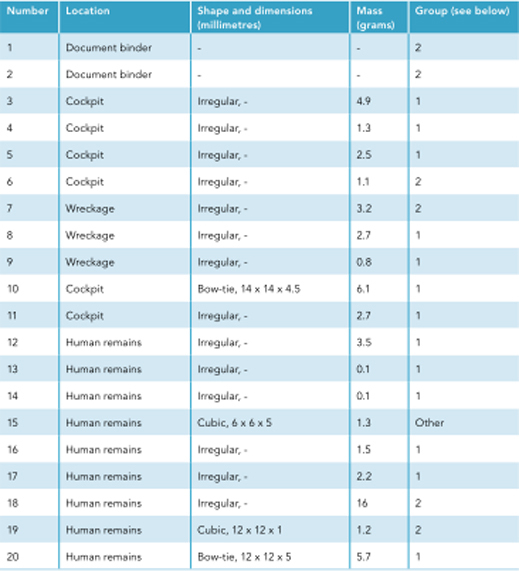 According to the latest JIT report this week, the number of bowties and cubes has dwindled from four identified in last October’s Dutch Safety Board (DSB) report to two, one of each shape. How and why did the other two pieces of evidence disappear in The Netherlands over the past twelve months? How does the JIT explain there was no shrapnel at all in the bodies of the 295 people, crew and passengers, who were behind the cockpit, in the main cabin of the aircraft? According to Mikhail Malishevsky, the Almaz-Antei briefer in Moscow yesterday, test-bed detonations of the BUK missile at the port position, 1.5 metres from the cockpit, where the Dutch claim the missile detonated, show many more impact holes and evidence of bowties than the Dutch report they have recovered. Malishevsky records that in the Dutch analysis reported last year the shrapnel impacts had an average concentration of 80 per square metre. He says the Dutch are now reporting an average concentration of 250 per square metre, but with fewer of the BUK warhead’s characteristic bowties. 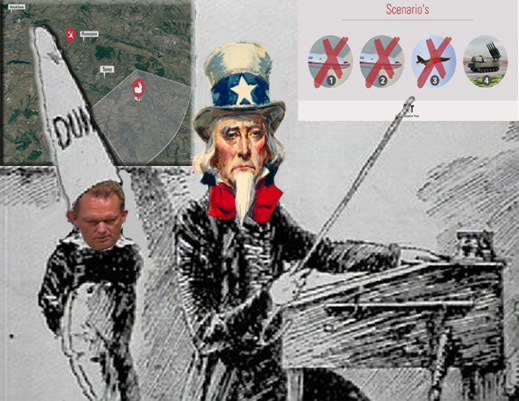 The discrepancy in shrapnel count is so large, Malishevsky draws two conclusions – that it was impossible for the missile to have approached from the east and struck head-on; and that the only trajectory consistent with the MH17 shrapnel damage pattern was one in which the missile flew parallel to the aircraft before exploding, and approached from the south, not from the east. “The hypothesis of a missile hitting the plane head-on was not credible. There is no way to explain the lack of fragments [shrapnel] as per the Dutch 3D model…” Source: https://www.youtube.com/watch?v=JbIPo8dW9b0 -- minute 20:51. Question 4. This is the question of who can tell their left hand from their right; north on the compass from south; port engine from starboard engine. The Boeing 777 operated as Flight MH17 was powered by two Rolls-Royce Trent 800 engines. The JIT presentation doesn’t address the difference in impact evidence between the two engines as they were found on the ground. The Russian presentation makes this an important source of evidence for proving which side of the aircraft was struck by the warhead. 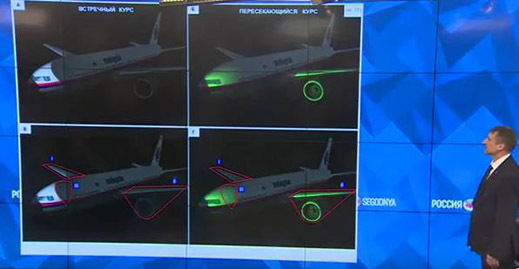 The Russian presentation also distinguishes between simulation models of what happened – a Dutch model, as reported by the DSB reports last October and the JIT report this week; a Russian model, as reported by Almaz-Antei – and the actual evidence of the aircraft parts recovered from eastern Ukraine and reassembled at a military base in The Netherlands. In distinguishing the detonation impacts on the two engines, Malishevsky refers in his presentation to the “right” and “left” engines. This is not intended to mislead, but it is confusing. Malishevsky means the right and left sides as he and his audience face the picture. So the MH17’s port engine is the right-side engine in Malishevsky’s presentation; it is relatively undamaged. 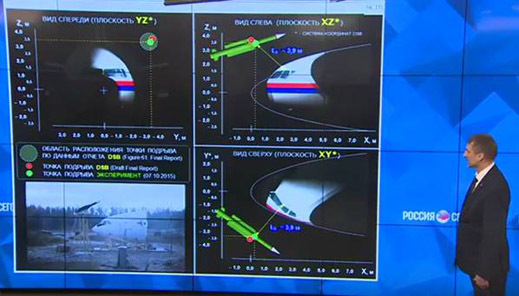 By contrast, the MH17’s starboard engine is on the left side as Malishevsky refers to it. The key claim from the Russian side is that for the engine to be as damaged as it was, the warhead must have detonated on the starboard side. And for that to be the outcome, the missile must have approached MH17, and been fired, from the south. So the question for Dutch prosecutor Fred Westerbeke (lead image, left) and Dutch policeman Paulissen, along with the 100 members of the JIT staff, is which engine is which in their evidence? Why does it appear that the MH17’s port engine – left-side looking forward, compass north for the plane flying east — not impacted by warhead blast or shrapnel? Why are there shrapnel hits on the starboard engine (right-side looking forward , compass south) and why was it deformed so differently? Why has the JIT omitted to analyse the engine positions and report this evidence? A summary of these questions and the answers so far can be plotted on the map of the crash area. Red line - MH 17. Blue line – firing point at Snizhne (in Russian Snezhnoe), according to the JIT version. Green line – firing point at Zaroshchenskoe (misspelled in the map), according to Almaz-Antei version.